When processing particles 0.5 mm in size and larger and when there is a large difference in density between the particles, gravity separation process is very efficient. From 0.5 mm to 0.1 mm efficiency drops off, but the devices can still be effective. But, when the particles become smaller than 0.1 mm in size or the density difference between the particles is small, the speed with which the particles will move apart maybe slower than the retention time in the device. This prevents the particles from separating. One solution is to increase the force on the particles by speeding up their movement. Current available technology has increased this force by 5 to 10 times in cyclones. This is a significant improvement, but, still only works for a small range of sizes and densities. It is into this area the use of centrifugal concentrators has stepped. They can increase the force to 50 to over 150 times gravity (or higher (reported up to 300 times gravity)). They can separate particles which have been impossible to separate by other than flotation or chemical processes. In general this increased force is applied by using a rotating bowl into which the slurry is fed. Two basic configurations exist vertical and horizontal. While there are many internal configuration and internal operational differences, they are generally used in similar applications. The main difference (between the two orientations is rotational speed and thus the force applied to the feed stream, the horizontal units are primarily low speed/force (50 – 60g), vertical oriented units are primarily high speed/force (>100g). Centrifugal concentrators are normally used as part of a larger plant where they treat the finer particle size range or as a secondary cleaning circuit, processing a jig concentrate. Centrifuges can be used in multiply units to allow for more continuous operation during cleaning (as shown), but are often used as single units performing cleanup on the stream. Where v is the settling velocity, p" is the apparent density (g/cc) of the medium, and p is the specific gravity of the particle, g is the acceleration due to gravity. For a 100 micron particle, going from a 1g field to a 50 g field the settling rate for a 2.5 specific gravity particle increases by 30 times, and doubles again going to a 100g field. And the difference between a 2.5 and 5.0 specific gravity particles goes from 1 to 2 cm/sec to 30 to 80 cm/sec at 50g, and 60 to 140 cm/sec at 100g. Centrifugal concentrators come in several different configurations, the most obvious being orientation; horizontal or vertical, besides the operating force (as noted above). 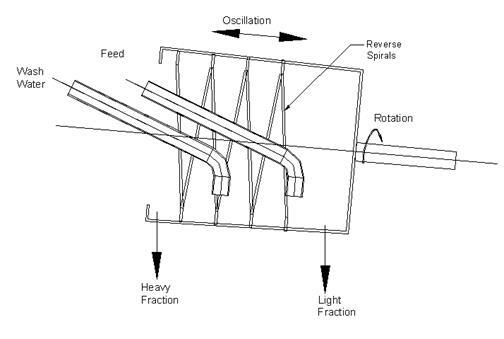 Horizontal units share a similar general configuration (Figure 3), consisting of a slightly inclined rotating drums with spirals or racks to move the heavy particles up and wash water to wash the light particles down the slope. The original design was the Mozley Multi-Gravity Separator, a similar unit is Oro Industries Multi Helix Spiral. 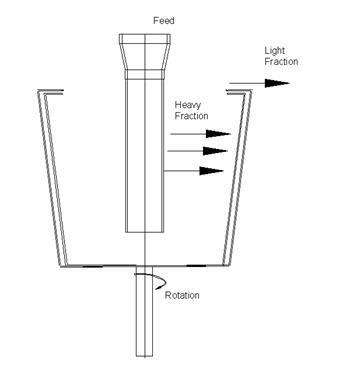 In both units, feed slurry is distributed along the inner surface of a slightly tapered rotating drum. Light particles are carried by the flowing film to the far end of the drum, while heavy particles pinned against the wall by the centrifugal field are carried by rotating scrapers to the opposite end of the drum. A small amount of wash water is added to the heavies discharge end of the drum to wash out entrained low-density particles. The general configuration for high gravity units is similar (Figure 4 & 5), consisting of an upward opening basket operating at high speed. The feed is general to the bottom and the material works its way upwards with the light fraction discharging at the top. The heavy fraction is either retained in the groves, or a method to remove it is included. Wash water is sometimes used in a fluidizing manner or as a means of washing the appropriate gravity fraction onwards. For vertical machines, there are currently three main units; Knelson, Falcon and Kelsey, with Knelson and Falcon being the main contenders. While the different types of centrifugal concentrators look similar from the outside, their internal operation is different. One relies entirely on the increased force on the particles due to operating at high revolutions (Falcon), while another also uses a fluidizing effect of water to help keep the bed open (Knelson), and the third imparts a jigging motion to improve separation (Kelsey). The Knelson semi-batch concentrator consists of a rotating truncated cone with internal rings to collect the heavy fraction. 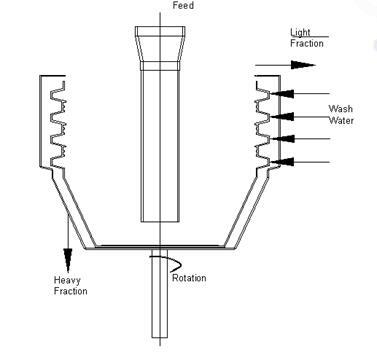 Feed enters through a central feed pipe and flows upwards along the outer wall from ring to ting until it overflows the top of the rotating bowl. Rinse water forced through perforations in the rotating bowl creates a fluidized bed of particles between each ring. Heavy particles are collected behind the rings, while lighter particles are flushed over the rings and discharge out the top. Periodically the unit is stopped to clean out the heavy fraction. A continuous discharge version of the Knelson that has automatic discharge valves to lengthen the time between cleanout. The Falcon concentrator consists of a rotating, smooth-surface truncated cone. Feed slurry is down the center to the bottom of the cone and then flows up the wall of the cone... The slurry forms a thin flowing film in which particles become stratified based on differences in density. The lighter particles ride atop the stratified layer and are discharged over the top of the cone lip. The heavier particles slid along the inner surface of the cone and are discharged through the cone wall via small reject ports. The Kelsey jig consists of a series of hutches which are rotated about a central feed pipe. A cylindrical screen is mounted across the top of each hutch to retain ragging material. Feed slurry enters the unit through the central feed pipe and flows outward across the bed of ragging. Mechanical pulsators located within each hutch create oscillations in the bed. Low-density particles flow across the screen and heavier material and overflow the top of the unit, while heavier particles pass downward through the ragging/screen and are discharged through actuated valves. In most cases, the unit forms its own ragging material form coarser and heavier feed particles. Some heavy particles get trapped on the screen requiring periodic shutdown for cleaning. In general it looks similar to the Knelson Semi-Continuous with the addition of a jigging cycle by the pulsators. Like all processing equipment centrifugal concentrators are volumetric in design, but with a wide variation in operating speeds and feed conditions the unit capacities cover a wide range. In general the vertical high speed machines run at higher feed densities and thus higher unit capacities than the slower speed horizontal machines. The depth of the bed in the machine plus the density of the feed also contribute. Feed densities of up to 50% solids have been reported for some vertical machines, while the horizontal machines generally operate around 25-30% solids. As the diameter increases area of the unit increases and the effective force of separation also increases so that unit capacity should also increase. For this paper some general sizing criteria are presented, but more than with any other type of device, it is recommended that data from the vendors be solicited. 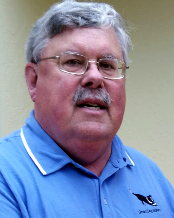 The following is an example of sizing and selecting a centrifugal concentrator. It is included for reference only. In actual practice many different factors can cause the specific selection to change. .From Table 1, this would require one (1) 900 mm horizontal or two (2) 600 mm horizontal, or one 1000 mm vertical machines. From Table 1, the water requirements for a 900 mm horizontal unit would be 200 to 800 g/min. For 1000 mm vertical unit it would be 350 to 1600 g/min with 35 to 160 g/min added as wash water. It is interesting that the high capacity, high speed units are of a vertical design while the lower capacity, lower speed units are horizontal. 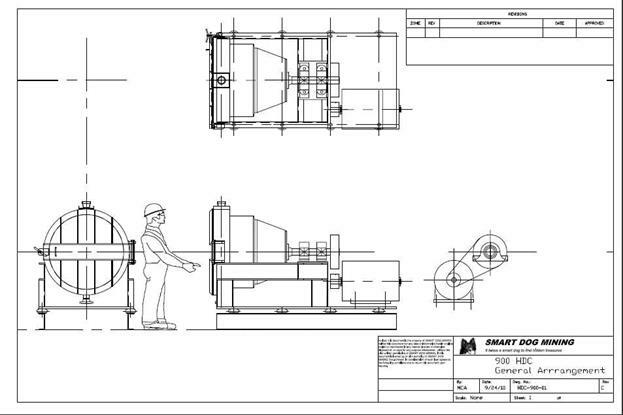 There are some reasons for this, primarily at the high speeds the vertical design does allow an easier bearing design, but it does require additional vertical clearance for basket/drum removal, and also places the drive units in more difficult to maintain position (under the units). This raises the question of the design of a high a speed horizontal unit, such as shown in Figure 7.